Hope all is well where you live. sleet, rain and freezing rain. Not sure if anyone knows what Blogger is doing now? to add comments...now they are doing away with it. So how will everyone be able to comment now? the number of followers you have. We did a vintage bedroom theme. I so love these kitties! Do you remember these phones? These quilt blocks are fun too! Vanity with all of the necessities one would need. to create this heart in our window. with Bob about our antique store. for the businesses in town. do better to become a tourist town. had to spend 10 hours in town. Visit all of the shoppes and restaurants. one of the secret shoppers came in. I do not know who talks to our customers more? Bob or I...but we both talk a lot to our customers. We always treat then as our Back Porch family! Well enough of my babbling. Have to get to work or I will be late. some new mats I drew for our show. Loving Our Store Blessings To All! we are going to see our grand daughter which is always exciting for us. Then really just some cleaning and down time. How cool that you were acknowledged as the most friendly store. So often I walk in to an antique shop and barely get a hello. No real weekend plans. Being retired, every day can be my weekend if I so choose, but I am busier now than when I worked! Janice, I will send you the email I got from Google, regarding their changes. I am not sure what is going to be possible going forward. Does Blogger have a homepage where they talk about how they will accommodate your viewers and offer a way for them to post. I don't think the solution will be coming from Google. How does it work with those sites that do the picture identification? Is that something your site could do? 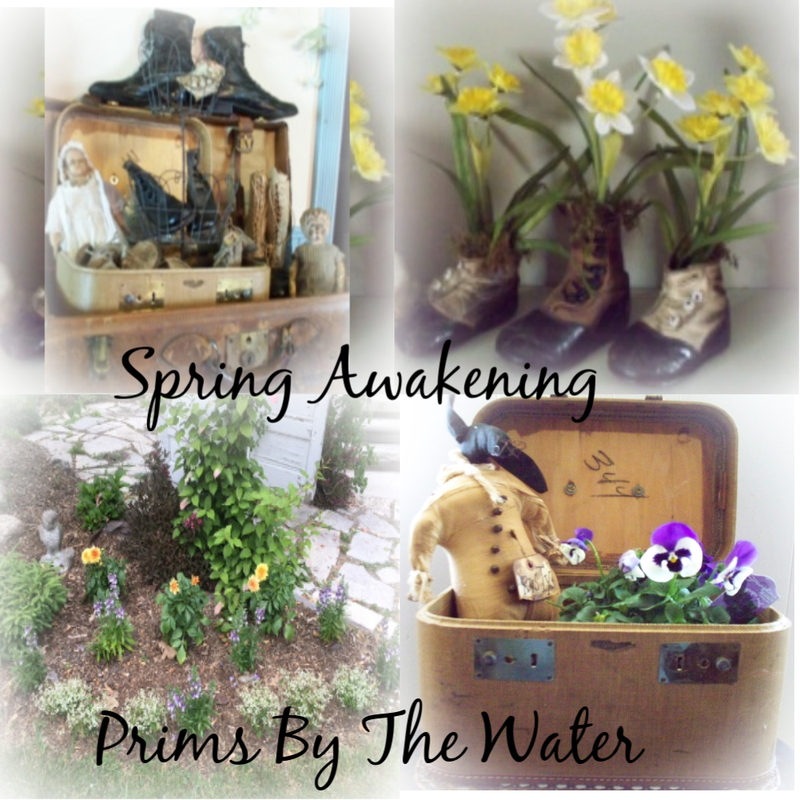 Like Julie over at Primitive Heartstrings? I love how you decorated the store window for Valentine's day! And a BIG CONGRATULATIONS on your store's award as most welcoming and friendly!! Your store window decorations look so lovely and how wonderful that secret shoppers favored your store! Congratulations! Not completely understanding what Google is doing. Well, congratulations on both the online magazine interview and the “friendliest welcome” ! Your store window displays are pretty....I love the post-it note idea...very clever LOL. As for Blogger, I am probably the “least up to date” of your followers having been gone so long....but, as I understood things, some blogs chose to go with Google+....I did not, and therefore, cannot leave comments on blogs that are (e.g. Karen Martinsen’s at KM Primitives/My Colonial Home). I switched to Google+ one a week or so ago, thinking it would help me leave comments on Google+ blogs....but it ended up meaning also that those followers of mine who weren’t Google+ couldn’t leave comments on MY blog. Sooooo....long and short, I think if you are NOT Google+ (which I don’t think you are because I can post here), you will be ok....???? Yeah....clear as mud, huh? Have a good weekend! Congratulations on your store being favored and good for you for working so hard for your customers! Love, love, the decorations!